Self Select Distribution (SSD) offer publishers of free magazines and newspapers a distribution service into the UK’s leading supermarkets, including Tesco, Sainsbury’s, Asda, Morrison’s and Co-op. Free newspapers and magazines have grown significantly in the last five years as publishers adapt strategy to capture a changing readership who are now able to readily access news, features and content on phones and tablets and have subsequently cut back on paid-for magazine and newspaper purchases. Supermarkets offer a very high weekly footfall of local shoppers as the majority of consumers still visit a major store at least once per week. 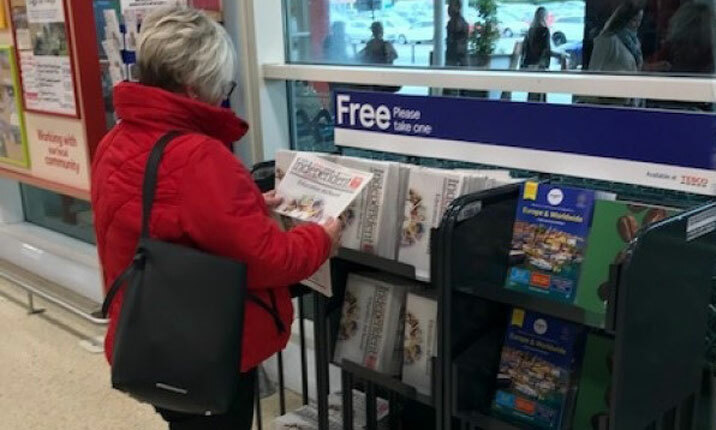 A diverse range of free publications have become an integral part of the customer service at major grocery stores in the UK with millions of copies picked up each week from branded instore displays. Major supermarket brands also appeal to both major advertising agencies and local advertisers as the pick-up method of distribution continues to develop. Every free copy is taken by conscious choice by discerning shoppers from a range of free titles which helps to deliver good quality response to advertisers. Publishers can either target by socio-economic profile, by postcode, by town or by region depending on the individual strategy. Geographically, SSD can offer distribution into stores from Inverness to Plymouth and everywhere in between. A range of regional warehousing takes delivery of bulk copies from printers across the UK and stores them until distribution is required. SSD’s flexible approach to developing small entrepreneurial publishers allows anyone to launch a free local publication and gain access to a proven network of 6000+ stores across the UK. Publishers can start with a single store in their local town and then grow distribution as revenue increases which allows publications to flourish with no hidden costs or onerous long term contracts. SSD are ABC accredited ensuring publishers can claim copies on their circulation certificate. Proof of delivery photographs are taken on every visit and pick up reports ensure copies are displayed and managed effectively. Handheld PDAs provide real time information to the SSD team and give publishers confidence and satisfaction that their publication has been distributed effectively. Current clients include Evening Standard, Reach, Newsquest, JPI Media, Iliffe and a large variety of local independent publishers and entrepreneurs who are growing and developing their free titles via SSD.